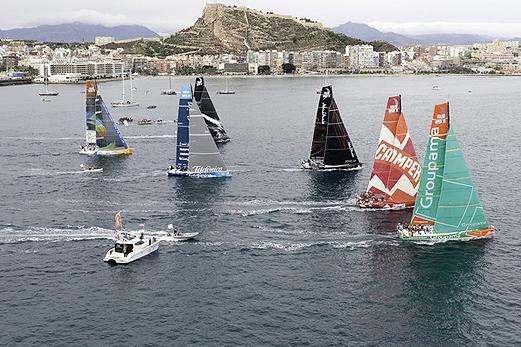 The day started with rain and gusty wind but that did not deter the teams, guests and fans to support the boats as they left the dock in Alicante at 1130am this morning. By the time racing was ready to get going the breeze had died to around 8 knots northerly providing testing conditions for all. The race got underway on time with Abu Dhabi high and fast off the line and moving into immediate control of the race which they went on to win comfortably. At the first mark, Abu Dhabi led around followed by Camper, Puma, Groupama and a bit of a gap to Telefonica and Team Sanya. Team Sanya managed to overtake Telefonica down the first downwind leg moving into 5th. The boats then headed up to the windward leg on a tight fetch where the wind died completely and brought in a number of shifts. Camper were the first to struggle and dropped from 2nd to last place momentarily. Team Sanya moved up to 3rd and all was looking very exciting. The teams then had to gybe back to reach the gate with Abu Dhabi getting around cleanly and heading to the finish with pace.